INSPIRATION TAKES SHAPE: THE MINI LIVING “FORESTS” INSTALLATION AT THE LONDON DESIGN FESTIVAL 2016. It is well known that in cities like London and New York, affordable places to live are in short supply. House/flat shares or one-bedroom apartments that fall within a reasonable budget offer barely enough room for our everyday needs. At the same time, the world of work is also undergoing a period of change as workplaces go mobile and self-employment blooms. These developments have led to “third places” – those that lie between work and home –growing in importance. 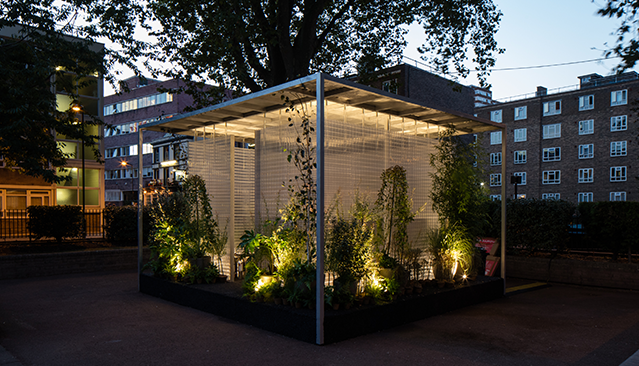 At the London Design Festival 2016, MINI collaborated with Asif Khan, whose installation MINI LIVING “Forests” explored three interpretations of these “spaces between spaces”. Each of them were designed to encourage specific uses: relaxation, getting together or productivity. The design of the three spaces used plants to improve city living. The MINI LIVING “Forests” installation was open to the public and available for use from September 17 – 25, 2016. The three installations were located within walking distance of one another in Shoreditch, London, forming a network that visitors could explore and experience. Their clear material language created a deliberate contrast to Shoreditch’s urban setting with walls made from several layers of transparent, corrugated polycarbonate. The green of the plants was revealed through the walls and the materials constructed a purposefully diffused connection with the outside world resulting in an intimate, private space. MINI’s exploration of third places and the solutions that improve urban life will continue later this year with the launch of a new, long-term initiative in the U.S. called A/D/O – a 23,000 square-foot space for design in Greenpoint, Brooklyn, which will introduce a diverse programme of resources for creative professionals, including a prototyping studio, in-house accelerator and open workspace to become a prolific source of ideas for the future.